Tonn Nua gets its name from the Irish words for New Wave. The band is a new generation of young musicians playing traditional music from Ireland and Scotland. They live in the wooded rolling hills of the Willamette Valley in western Oregon. 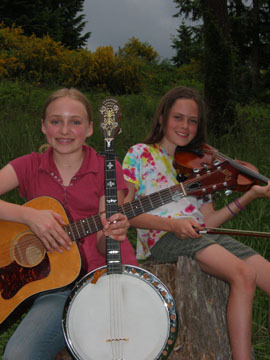 The band originated in 2004 with the lively fiddle of then 10-year old Ansel Dow and the feisty banjo of 12-year old Alison Helzer. In the spring of 2006 the band added three new members, the Garcia triplets - David, Daphne, and Zoe - who had established reputations as young jazz musicians. All the musicians in this band are competent on more than one instrument, which gives Tonn Nua a rich and varied sound. The following blend of instruments does not exhaust the possibilities: tin whistle, octave mandolin, saxophone (David), fiddle, bagpipes, uilleann pipes (Ansel), guitar, bodhran, brass (Daphne), upright bass, flute (Zoe), banjo, tenor guitar, mandolin (Alison). Tonn Nua frequently performs at Irish and Scottish festivals throughout the Pacific Northwest.